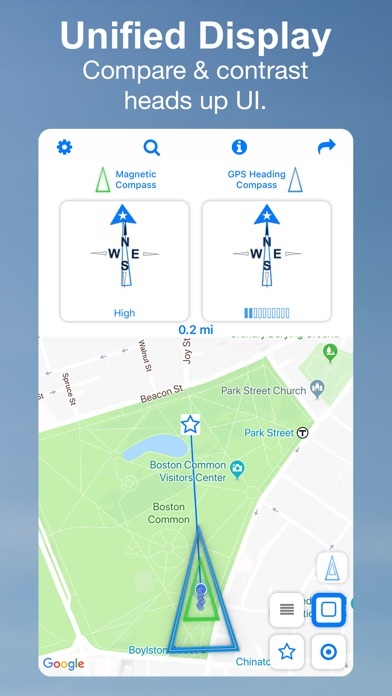 Not just any old magnetic compass, Northern is a powerful navigation tool that lets users cross validate and compare multiple directional/navigational readings within a single unified interface. We believe this is a fantastic solution to a hard problem, namely that no one source of information is ever 100% accurate. In short, Northern is designed to help our users more confidently and reliably decide which direction they are heading. Our specialized, dual compass display is shown alongside Google Maps, providing a single, simple, focused interface, designed from the ground up to more effectively orient users within their environment. 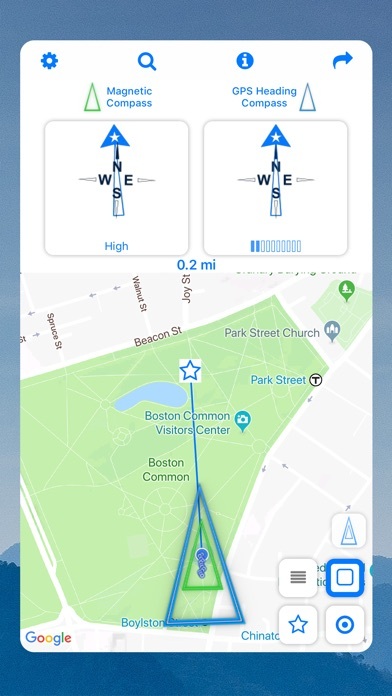 More reliably locate North South East and West, or even better, select a destination from our map - Northern will then display an arrow that locks onto these coordinates even while you move from one point to the next. 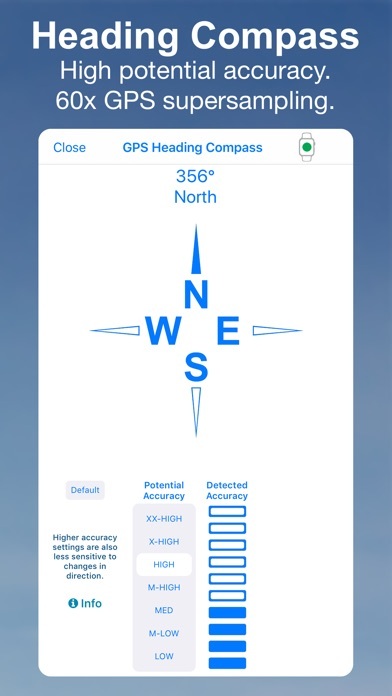 Compass Types * Compass #1 - GPS Heading Compass - Extremely accurate given a strong enough GPS signal and straight enough path - Works on your Apple Watch while your phone is in your pocket - Users can select how many samples they want to include with each direction reading - up to 60 for very long paths or as few as 3 for more responsive readings - Each new GPS location sample is analyzed along with all other samples providing a continuous solution - Each solution is then run through a specialized algorithm that calculates an approximate accuracy - GPS hardware doesn't suffer the same type of magnetic interference as the magnetometer driven magnetic compass (Compass #2 below) Compass #2 - Magnetic Compass - More sensitive then the GPS Heading Compass - Includes hardware accuracy reporting - Our new pointer mode lets you view your iPhones magnetic compass readings on your Apple Watch Northern is Great for ... ... wanderers ... ... those with a poor sense of direction ... ... people who like to explore, know where they are, but not necessarily require a rigid set of directions. Extra Features... 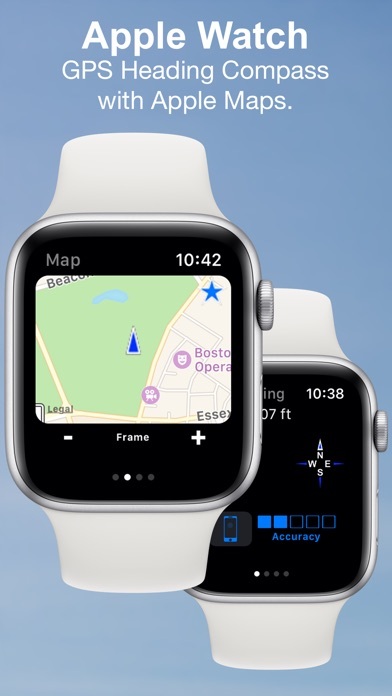 In this latest version 3 we have integrated Apple Maps into our Apple Watch extension. 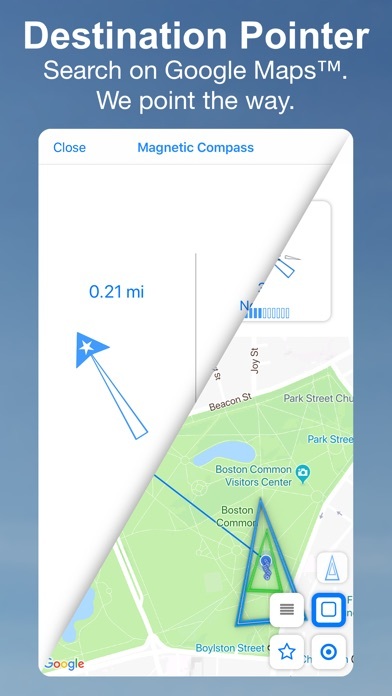 Users can now reference surrounding streets and other landmarks right from their wrist. Northern also uses Google Maps on your mobile device. Users can toggle between terrain, satellite or hybrid modes. We've also integrated Google Places, letting users quickly search for any destination with only a few taps. Fun sharing features, including a scavenger mode, let users leave scrambled messages for one another - just find the location to unscramble. * Apple Watch does not have magnetometer hardware. 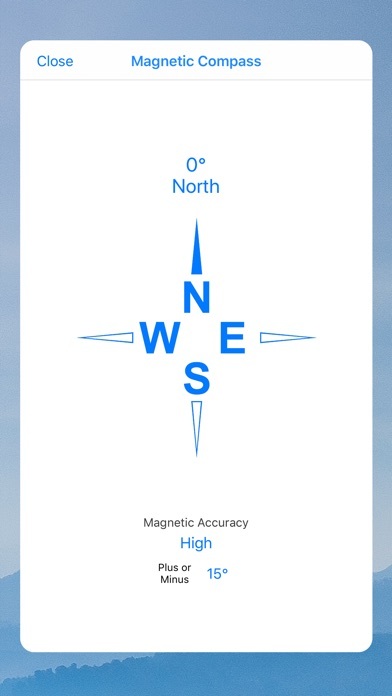 All compass magnetometer and GPS heading readings are sampled from paired iPhone hardware. Such a great compass, just follow the arrow. Pretty disappointed in this app. I was hoping to use it as an easily visible compass on my watch, but no matter what I do to it, it only displays instructions on how to turn on background activity and the “force sleep” screen. And yes, following the instructions on the screen DOES NOT make it go away. The app is nice enough on my phone, but it’s totally useless to me there since I already have maps and compass installed. 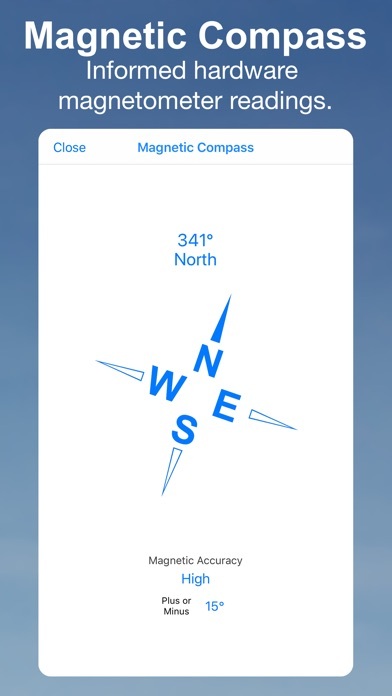 Best, most accurate, and easy to read compass offered on Apple. Completely simple, as real compass. Just point and you know exactly the direction in which you’re pointing. 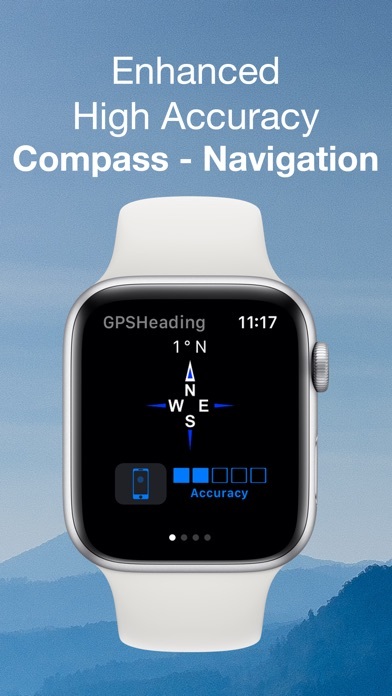 IT SHOULDNT BE SO DIFFICULT TO PUT A COMPASS ON APPLE WATCH. I don’t get it yes you have to play with apps to develop capacity to utilize them but this needs more “how to “ directions (pun intended). This has a great interface on the phone and purports to allow you to use the compass on the watch. However it only lets you see the directions feature and does not show the simple compass feature on the watch. All i wanted was to be able to look at my watch and see a compass. If improved to show the compass on the watch, would be a great app.